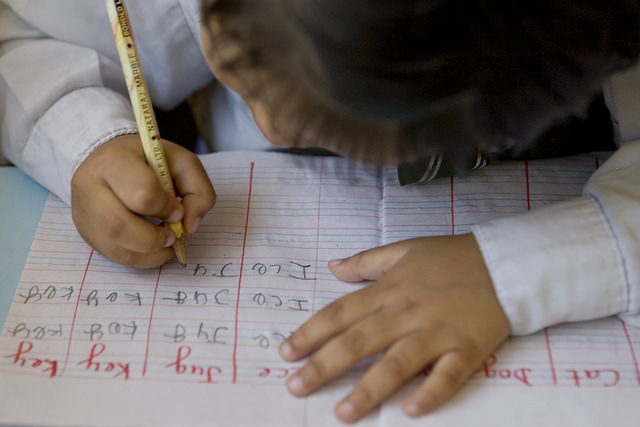 This blog by Kieran Cooke from the Universal Learning Solutions, explains how a synthetic phonics approach can be taken to literacy education that can mean governments don’t have to choose between either instruction in English, or in their local language; children can learn in both. The approach aims to support governments in ensuring all children learn the basics by the time they reach Primary 4. Education research from across the globe has demonstrated that it is ineffective for pupils to learn to read and write by memorising, due to the limited brain capacity to memorise whole words. Instead extensive research such as that by the US National Reading Panel has shown that teaching using synthetic phonics is a highly successful alternative. This approach teaches pupils letter sounds (for example, mmm not em, sss not es) and how to blend those sounds together to read words (so d-o-g makes ʻdogʼ). At the same time they learn how to write words by segmenting a word into its sounds, and then forming letters for those sounds. Universal Learning Solutions (ULS) delivers literacy programmes using this synthetic phonics approach in Nigeria and elsewhere. 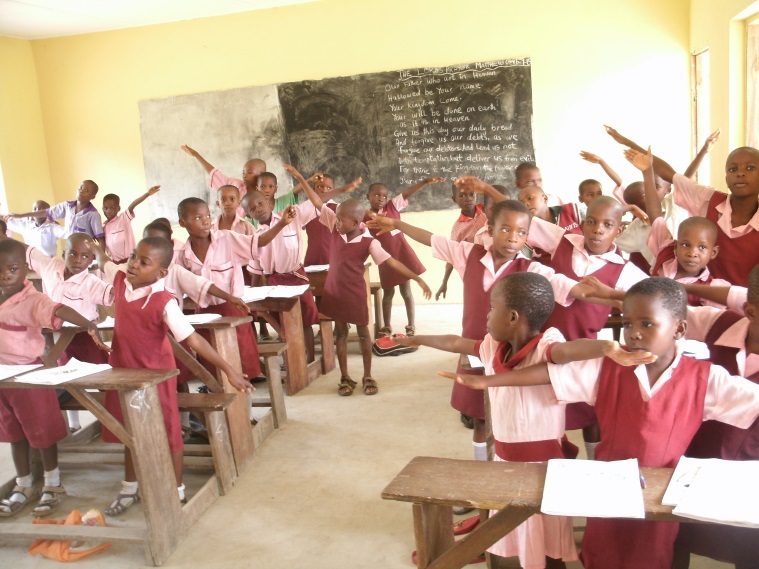 So far, over 8,000 teachers in Nigeria have been trained in teaching the synthetic phonics approach in English and over 500,000 pupils have been provided with synthetic phonics teaching and learning materials. These programmes have shown that pupils using this approach, regardless of their mother tongue language, have made significantly faster progress than those taught using whole word approaches. For example, in Akwa Ibom state in Nigeria, children taught using synthetic phonics in English were on average 17 months ahead in their chronological reading age in English than pupils taught using conventional methods after just 36 weeks. In Cross River State in Nigeria, pupils for whom English was not their mother tongue made significantly better progress in reading and writing in English using the synthetic phonics approach than those pupils who had English as their mother tongue. These programmes demonstrate how schools should not have to choose whether to teach in mother tongue or English, as is being suggested in the two former blogs on this site about Malawi and Pakistan, but instead that a synthetic phonics approach would allow for both languages to be taught where the mother tongue has similar orthography to English. One study using this approach with Kannada-speaking children in India shows that synthetic phonics in English is more effective if it is introduced in the mother tongue first. Teaching in the mother tongue for one term gives the pupils enough time to learn the letter sounds of their mother tongue and read simple words. It provides enough time for pupils to read and write confidently before the language of instruction changes to English, often in upper primary or lower secondary. This is why ULS now aims to trial introducing synthetic phonics in Hausa, the local language, in Zamfara State in Nigeria for one school term before then moving to instruction in English. An alternative approach is to teach English and the local language from the outset simultaneously every day. This is particularly appropriate for languages which have similar orthography to English. In such cases, pupils can be taught the letter sounds at the same time as learning how to blend these letters together to form words and segment words into sounds. They then use these skills to read and write both in their local language and in English. Having worked with communities in Nigeria and elsewhere for 9 years, ULS has found there is a large demand by parents and caregivers for their pupils to learn English as they see this as a crucial skill for the future. Furthermore in many countries the language of instruction changes to English during the latter stages of education in some countries. This leaves those who did not learn English in early primary being held back when they make the transition. English can also appear a viable solution to the problem many countries face when there are children with multiple home languages in the same class. It is clear, therefore, that there is need for children to read and write confidently in both English and their local language. However perhaps we need not have to choose between whether pupils should learn to read and write in English or their local language. Instead pupils can use synthetic phonics in both English and their local language as this blog suggests. Currently there is not the required research evidence to indicate whether teaching with synthetic phonics has stronger education outcomes when taught in the mother tongue from the start, or simultaneously with English. Having this research would make a significant contribution to furthering discussions on this topic. This entry was posted in Early childhood care and education, Ethnicity, Language, Learning, Literacy, Marginalization, Primary school, Quality of education. Bookmark the permalink. Synthetic Phonics is the strategy applied by Esspin IQTE Pilots for schools in kaduna state and we are succeding. We used Hausa as a means of instruction for IQTE Schools. Hi! I agree with the synthetic phonics approach, I think – but I can’t think of a single orthography or phonology system which is similar to English’s! I would love to know how you avoid the huge contradictions between the vowel symbols and sounds of English and those of any African language. That’s where the biggest conflict lies, I’m afraid. I recommend starting with mother tongue reading for the first two years, while teaching English ORALLY long enough for the kids to master reading in a language they actually speak. It also should give kids readiness to read English—actually comprehending what they read, once they start. And many concepts get confused: phonics, mother tongue etc. Reading is a perceptual expertise of vision and primarily depends on detection of patterns in milliseconds. To do this students need letter by letter instruction (phonics), analogies to compose larger chunks, and TONS of PRACTICE WITH A MODICUM AT LEAST OF FEEDBACK. So just phonics will not increase speed. The poor get no practice or feedback. The books, if they have any, have big pictures and very little text. Probably grade 1 needs 4000 words to get to automaticity. The teacher must pass from student to student to see if they read, and do this for 60 or more who are in the class. Whichever program does this, will succeed with nearly 100% of the students. The rest will get merely “statistically significant differences”. Interesting that the article you link to on Malawi about mother tongue education is advocating a form of phonics. I think phonics as a tool stands apart from the debate about learning in mother tongue – as you say, it can be used to decode and sound out any language. Teaching individual letters and combining them into syllables and words is clearly the way the brain processes information most efficiently. For all but about 8 languages in the world, the process is straightforward. So, all African languages should be taught through phonics. But English (and French) has a difficult spelling system that requires some whole word learning (saw, sew, sow, etc). Phonics is preferable and doable, but it’s messy. As a result, English reading takes 3 years to teach, whereas most other languages need 100 days or so. The reading advice from English is often too complex or downright inappropriate for other languages. But people don’t know what to use and what to leave. So we see complicated methods and bad advice worldwide. For example, letter sounds in most languages when pronounced will compose a word, but in English they are not stable, and letter names must be used. This creates much confusion for low-income students who get no help at home. Learning to read in English and local language reading are basically incompatible. When another language exists, even if students know only a bit of it, reading can be taught in 100 days or so. At the same time students should be studying English ORALLY. In fact, the students will make more progress in the actual language. When they can read about 60 words per minute in Hausa, Wolof or whatever, then they can learn the spelling rules of English. It will be a much simpler exercise. The MVP approach outlined in the Malawi article is also advocating for a similar strategy that you mention is being done in Zamfara State (Nigeria) and Kannada (India), where letter sounds should be the focus and local language should be taught as a foundation for learning these letter sounds. After these foundational skills are learned and children can use letter sounds to decode words in a consistent orthography (such as most local languages in Africa), then these skills can later be applied to English, along with learning the more complex rules of English phonics and spelling nuances. There are many parallels between your article and ours. Research could pause serious confusion. My country is pursuing what research says about the importance of teaching literacy in early grades in local languages because of the benefits this brings to learners. The use of English for instruction will delay until the 5th grade. It is confusing and discouraging therefore to read about the teaching of local languages and English at the same time to develop literacy skills, especially given the fact that the English spelling system is complex. Anyway I suppose what this posting suggests is for countries to choose what they believe would work very well for their situations. A government can teach English as a subject any time. Grades 1-2 should be done orally. The difficulty starts when English is used as a language of instruction. Poor schools teach very little of it, so children may try to learn science with a vocabulary of 300 words. Predictably only the middle class manages. English-medium education is necessary in some societies (or French), but it should be avoided. Students just don’t know enough of the language unless they are middle class. Take a look at Europe. Everyone is learning English. But learning IN English? Only the Brits. The Albanians, Hungarians, Serbs, Greeks all do it in their own languages all the way to the university. Nigeria surely has the means to do the same. Mother tongue is better way to achieve well education . So don’t have others way in the world. But English is better way to understating in any where. So Every people should teach English . But don’t avoid your mother tongue . Thanks to written this informational article. I agree. Teach students lots of English, but not subjects in English. They will just learn less math, less geography etc. Nice piece of work which needs further trials. Please permit me to raise another issue. Many NGOs work on developing and distributing reading books. They are crucial in local languages. Undoubtedly they can provide practice and speed up reading for students who already know how to read. But can a book teach an illiterate child to read WITHOUT parental help? Can a child who identifies just a few letters make sense of a book? Your personal thoughts and particularly observations would be helpful. I’m working in Mozambique and this whole area is really interesting to me. We have been developing materials in Nyungwe, a language spoken by almost 500,000 people in central Mozambique. There are very basic attempts in the public schools to introduce bilingual education, but education policy here is very favorable to using L1 to help students along and contextualize much of National curriculum for each community. I’ve been comparing the orthographies of Portuguese and Nyungwe for years, and there are more similarities than differences. I would like to explore the possibilities of supplementing national curriculum with some synthetic phonics in L1 for our communities. I think it is especially important to help new readers make a connection between meaning and written forms. We see many people “automatically reading” in Portuguese, but never looking for meaning in what they read/pronounce. Almost all “important” messages are given in L1, while all writing is in Portuguese. Wouldn’t giving people an opportunity to read words they understand in the very beginning help them to look for meaning in all words they read as they read in the national language? I’ve started the course Helen Abadzi mentioned above. It is really helpful as I look into these possibilities. Thanks for the kind remark above. I visited Mozambique in 2007 as World Bank staff and have also interacted since then. Of course Mozambique ought to have phonics-based textbooks in its many languages, with much practice. And L1 has become increasingly important. But the pedagogical institute (whose precise name I don’t recall) for some reason does not believe in synthetic phonics. Mozambique has one of the hardest grade 1 textbooks as a result, and makes implicit assumptions about the human visual system which do not stand up to reality. So the task seems to fall on NGOs to produce such books. The institute may be the INDE (Instituto Nacional de Desenvolvimento de Educacao). Several NGOs are interested in helping schools improve education. In fact, this week I was given permission to start a “vacation reading” group with illiterate 3rd and 4th grade students at a public school. At school level I find more possibilities for sharing ideas and an openness to try some new things. Within the structure of “curriculo local” (local led content in 20% in each school subject in primary school) there are wonderful possibilities for innovation. Speaking local would definitely enable them to understand their own culture. But Learning English language would give them the benefits of communicating with any region of the world without an intermediary assistance and conveying their problems and queries to the external world better. So, both of them are equally important. Is there material to help students read in a local language rather than Portuguese? I had seen materials in Emmakhuwa. For students who really have not learned reading (and that’s the majority), large letter by letter books ought to be developed and photocopied. The textbooks I saw at least in 2007 were almost whole word readers with small letters. I can send you some examples of materials used in the bilingual education program for Nyungwe. There is some letter by letter introduction, but very little practice. I can email you some samples if that is helpful. Please do email them. More text must be developed for practice. If students know the letters, then other existing texts can be translated or adapted. Unfortunately educators don’t realize the importance of practice, so most textbooks are simply too short. There is no research to guide us on how much practice, but we must figure it out empirically. In my area, Tete Province, we are working with Nyungwe. There are materials for the bilingual education program.